Good kitchens roll with the seasons. When fall sets in, and the summer tomatoes and basil have been mourned, greens and sweet potatoes appear as compensation. Peppers will keep going until the first frost. Come winter, we’ll have nothing fresh other than what is shipped in. So sprouts are a winter thing, especially if you have a sunny kitchen window. Sprouts are cheap, too. These days, Amazon has all the sprouting seeds and apparatus you need. Growing sprouts is no trouble. The only moderately pesky part of sprout farming is the final washing and rinsing away of the seed husks. 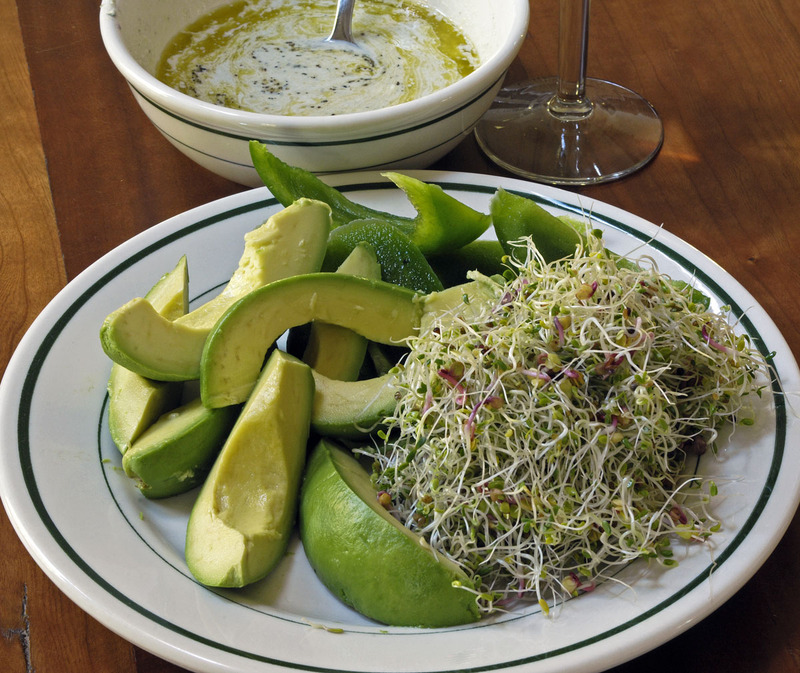 You want not just salad sprouts, but also bean sprouts for Asian dishes. I’m not turning into a food-only blog. It’s just that it’s also political season at the moment, and I have political duties almost every day, such as making sure that our county’s Democratic headquarters are open during the hours we’ve promised. Political responsibilities have cut into my time for doing and thinking about other things. After the election on Nov. 6, that will change. There are other cycles in good kitchens — not just seasonal cycles. Just now I’m in a healthy-kitchen cycle. But there are times when a good kitchen turns out comfort food, calories be damned. I’ve been there, and you probably have been, too. After all, we have to look after our psyches, not just our bodies. The aftermath of the 2016 election was such a time. Let’s hope that, the day after election day, Nov. 7, 2018, progressive people and their progressive kitchens will be celebrating, while deplorable people’s kitchens will be turning out even more deplorable things. We have just over two weeks to figure out the menus. I promise to post about whatever fare seems appropriate for Nov. 7. This was written by daltoni. Posted on Friday, October 19, 2018, at 5:14 pm. Filed under Food. Bookmark the permalink. Follow comments here with the RSS feed. Trackbacks are closed, but you can post a comment.